The Australian government tried to reassure in the wake of market gyrations. Australia’s deep ties to the fate of China’s economy and the latter’s hunger for Australian resources is well known. So the problems and gyrations in China in recent days and weeks have been watched closely here. The plunge in the Chinese stock market earlier this week had obvious, and immediate, repercussions for Australia. The All Ordinaries fell four percent Monday, and then spent the next two days bouncing back, 2.6 percent Tuesday and another 0.6 percent Wednesday. The plunge and recovery overall were quick, with the drop the steepest in two years. The Australian dollar has meanwhile weakened further, currently trading at 71 cents to the U.S. dollar, down from the level of around 75 cents where it has been for much of the year, and a sharp decline from the parity it enjoyed a few years ago (a strength than was tough on the country’s export sector). Australian economics blog MacroBusiness treated this comment with a grain, or many, of salt, “The dollar isn’t falling because capital is piling in.” and suggested the only growth area might be tourism. And this seems to be the point Australian politicians want to drive home: It’s the economy. The stock market crashes and currency devaluations apparently do not matter as long as the Chinese economy is still trucking along well enough to want to buy from Australia. Greg Jericho at the Guardian explains some problems with this position, namely noting that recent events are signs that China’s economy might not be as healthy as either leaders in Beijing or world markets might hope. 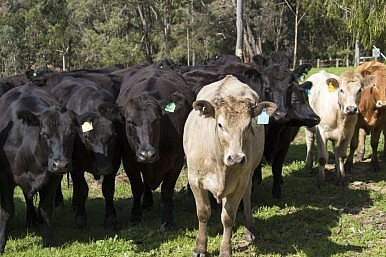 Given that the free trade agreement with China, the ChAFTA is due to go before Australian parliament later this year, there is a big focus on making sure everyone knows the potential for an improved Australian economy thanks to Chinese demand, which apparently is not slowing, according to the trade minister, pointing to the increase in Australian meat exports to China over the last three years. The Chinese, for their part, are also watching the ChAFTA thanks to Labor and union protests over the possibility of the importation of Chinese labor for some projects, which may undercut local job seekers (discussed further in the upcoming September issue of The Diplomat’s magazine). According to The Australian, Robb was asked in four interviews about this and was at pains to at once reassure any possible Chinese investors while attacking unions like the CFMEU at the same time. So for now at least the official message in Australia is this: Forget the stock market or the currency, because it’s the economy that matters.